In 1983, Herbert Armstrong gave a sermon on the source and origin of law. Within a community, laws establish acceptable standards and provide for penalties. He said, “That base, or body of beliefs from which you operate, is your system of morality and ethics.” That system of morality is also a body of laws and values. They are standards we have accumulated, at the very least, up to the time we were called. Where did our system of morality come from? Notice the word “our” because that particular code of standards is our own. Bits and pieces of it have been absorbed from others—parents, church, friends, and business associates—who have had influence on us. Yet, whether accidently, passively, or purposely, we have made those pieces ours by choosing to use them. Each one of us has a code that is probably not, in every detail, like anybody else’s. Proverbs 16:25 is a familiar scripture: “There is a way that seems right to a man, but its end is the way of death.” “Way” can be understood both as a narrow, single issue within one event or an entire package of values within a course of conduct. The proverb’s point is that mankind is frequently driven by blind self-deception or ignorance. He often has no absolute certainty regarding right and wrong because his standards have been merely absorbed and never seriously compared against God’s. How do ours compare? Any system of ethics and morality is by definition an expression of religion because religion, again by definition, is a way of life containing some measure of worship. Worship is merely a respectful response to one’s god. A system of morality concerns itself with values and the way one lives, even as God’s moral code does. The major overall difference is that His way works because it leads to life, even though in a given instance it may appear more wrong than ours. Because these principles are true, it leads to the fact that each one of us is technically the god of our system of values and its way of life in opposition to the Creator God, if our code of conduct is not in alignment with His. We are serving, and thus in a limited way, worshipping ourselves. Law, therefore, is codified, enacted morality. Whether it is God’s or man’s does not matter. The difference is in what they produce. What does man’s law produce on earth? History makes this obvious: confusion, warfare, constant competition, pain from all the collisions of values, and ultimately death. Paul writes in Romans 3:20, “Therefore by the deeds of the law no flesh will be justified in His sight, for by the law is the knowledge of sin.” Romans 4:15 adds, “[T]he law brings about wrath; for where there is no law there is no transgression.” Together, these produce a general principle that covers, not just biblical morality, but also secular. Laws reveal to us our religious and/or civic duties. In reference to God, law awakens us to a consciousness of sin. Through God’s laws we become aware of the contrast between what we do and what we ought to do. By enacting laws, our legislators tell us what is moral, right, and good in secular areas of life, but instead of calling a transgression of the state’s laws “sin,” we call it “crime.” In many cases, crimes are also sins. The difference between secular law and God’s law is that the latter contains clear moral values and reveals our duties toward the Creator God. Where do people get their ideas regarding what is moral? In the Western world, a new religion is rising. It is not really new, but it has a fairly new name: secularism. It is a type of idolatry, one that has been increasingly challenging this world’s Christianity over the past century, and it is gaining ever more strength in numbers and devotion here in America. The war between it and this world’s Christianity is virtually over—with Christianity rapidly becoming irrelevant. Persecution in the courts is already an established fact, and outright persecution on the streets cannot be very many years away. Also I lifted My hand in an oath to those in the wilderness, that I would scatter them among the Gentiles and disperse them throughout the countries, because they had not executed My judgments, but had despised My statutes, profaned My Sabbaths, and their eyes were fixed on their fathers’ idols. Therefore I also gave them up to statutes that were not good, and judgments by which they could not live; and I pronounced them unclean because of their ritual gifts, in that they caused all their firstborn to pass through the fire, that I might make them desolate and that they might know that I am the Lord. There is no doubt Israel was a religious people. Yet, notice the emphasis on the personal pronoun “My.” Their source of values was not God. Realizing the source of any given value or moral standard will go a long way toward determining its rightness and therefore its efficacy. What then? Shall we sin [transgress God’s law] because we are not under the law but under grace? Certainly not! Do you not know that to whom you present yourselves slaves to obey, you are that one’s slaves whom you obey, whether of sin leading to death, or of obedience leading to righteousness? But God be thanked that though you were slaves of sin, yet you obeyed from the heart that form of doctrine to which you were delivered. And having been set free from sin, you became slaves of righteousness. I speak in human terms because of the weakness of your flesh. For just as you presented your members as slaves of uncleanness, and of lawlessness leading to more lawlessness, so now present your members as slaves of righteousness for holiness. The source of a person’s values will determine his righteousness or his sinfulness. In addition, then, the source of the values to which he submits will also establish who is the sovereign in his life and of whom he is a servant. Finally, the source also determines whether idolatry is present and how the individual’s conscience will be affected and respond. If the source of values is man, then man is the sovereign. This can be perfectly acceptable as long as the value one obeys agrees with God’s values. Any person’s values may come from society in general, his family practices, his peers, or even his spouse. One often hears the justification, “Everybody’s doing it,” as a defense. The source of that value is “everybody”! Understanding the source helps to reveal the sin of idolatry in a clear but disgusting light. The Israelites of Ezekiel 20 apparently could, in all sincerity and with a clear conscience—and perhaps even with fervency—sacrifice their firstborn to Moloch! This is a vivid example of how twisted a person’s thinking and conscience can become by believing a corrupt source. At the beginning of our conversion, usually during counseling for baptism, we are asked to consider Luke 14:26-33 seriously. Verses 26-27 are particularly important because loyalty to Christ is the issue in this context. Jesus says, “If anyone comes to Me and does not hate his father and mother, wife and children, brothers and sisters, yes, and his own life also, he cannot be My disciple. And whoever does not bear his cross and come after Me cannot be My disciple.” Jesus makes it plain that, after entering into the New Covenant, our highest loyalty is to Him. This is extremely important because the character of every life is determined by the loyalty that rules it. Peter confirms Jesus’ words in Acts 5:29, saying, “We ought to obey God rather than men.” He made this affirmation following Jesus’ crucifixion. Persecution was imminent against the fledging church. However, we must understand that the world is always a threat against our loyalty to Christ. Life is a mixture of choices and compulsions, and many of our values have their source in the world. These values exert an ever-present pressure to conform to them, thus we must be aware. The pressure to make moral choices is the furnace in which character is forged. Our compulsions to make choices come in two varieties: 1) forced, as by a gun to our temple that demands, “Do this or else,” and 2) unforced, the pressure of old habits, perspectives, and attitudes engraved in our character, hangovers from our past. Thus, the past and the present both push at us to choose. What we chose determines where our loyalties lie and thus whether we commit idolatry. If we are not thinking carefully, idolatry is an easy sin to fall into. Psalm 81:4-5 states, “For this is a statute for Israel, a law of the God of Jacob. This He established in Joseph as a testimony when he went throughout the land of Egypt, where I heard a language I did not understand.” Asaph points out that God ordained the law of which he speaks. Law is inseparable from sovereignty. The god of any system can be identified by locating the source of its laws. From this principle, Mr. Armstrong concluded that the church is the only place on earth where the government of God operates. In the beginning of the United States, our system of law and our standards of morality were lifted in principle—but sometimes almost verbatim—from the absolutes of the Bible. After the Civil War, the basis of our laws gradually switched from the absolutes of the Bible to human relativism, which claims there are no absolutes. It asserts that every system’s values, indeed everyone’s values, are as good as the next. This philosophy began as mere advice to be tolerant, but as it became more popular, its adherents urged people to be pragmatic, that is, to adapt, to make compromises in values, to do whatever needs to be done regardless of its conflict with others’ values. Psalm 10:4 is central to this series on the Ten Commandments: “The wicked in his proud countenance does not seek God; God is in none of His thoughts.” This is of major concern because the first commandment is the most important. It lays the foundation for all that follow. If the source of a person’s values is not of the very highest order, he sets himself up for certain moral and spiritual failure. No other source can even begin to compare to Almighty God. The last phrase of this verse does not mean the “wicked” man is an atheist. In fact, He may be a nominally religious person. However, while undoubtedly considering himself realistic, he has such a low regard for God that he does not consider Him as he makes his choices in life. God plays no major role in his life, and he may even purposefully avoid Him. To him, God is not dead, but He is nonetheless an inconvenience brought into play only in times of extreme stress. He has essentially chosen to live without Him, and thus he is effectively worshipping himself. This description likely fits a high percentage of Americans. John’s warning against the world is focused on the very reason for the “source” theme of this article. The word translated “world” is cosmos in Greek. John uses it six times in three short verses, emphasizing its importance to us. It literally means “an orderly arrangement.” In other words, it means “a system.” The apostle refers to the environment and lifestyle system into which we were born. Our values originated from this source, and those values are a confused mix of good and evil, specifically designed to entrap us in a web of death. Cosmos identifies the system established on earth apart from the Creator God. Since the system’s source is Satan, it cannot produce life. The problem for us is that this system is quite appealing to human nature, and it is continuously exerting pressure on us to return to it. Yet, if we love the world, it precludes love for the Father. The Father is then pushed to the background of our lives. The basics of that system’s values are contained in the words “flesh,” “eyes,” and “pride.” Flesh indicates a self-oriented outlook that pursues its own ends independent of God, a focus that clearly produces idolatry. Eyes suggests being captivated by everything that entices the sight, drawing attention to the human attraction to covetousness, which is idolatry. Pride indicates a pretentious hypocrisy that glories in self, possessions, and accomplishments. This too is idolatry because pride focuses devotion on the self. This system is the source of much of what we believed, and its author, Satan, has been our god, though we did not realize it. Because Satan has been clever enough to include some of the true God’s system, beliefs, stories, and practices within his, the Devil’s system has an air of righteous authority. We can feel good, even joyous and inspired, while doing evil—like committing idolatry—in submitting ourselves as servants to his way. Romans 1:18-32 provides us with a compelling history of mankind’s efforts to avoid God as the source of their values, and it shows what this has produced. Satan has made strong and persuasive efforts—seemingly doing everything in his power—to diminish the importance of obedience to the Ten Commandments. Mankind’s failure to keep these godly standards is responsible for the condition of the world. The undermining of their importance began with Adam and Eve in the Garden of Eden. Satan’s persuasions were so enticing that they submitted to his values despite having seen God literally eye to eye! None of us has been blessed with that gift. However, in God’s judgment that does not let us off the hook. Yet, mankind cannot plead complete ignorance of God because He is revealed by His handiwork. Since men will not seek out and obey the true God on their own, the best they can do in regard to a standard of values is their own experience, and that has produced this perverted and violent world. That is the story of idolatry in Romans 1. While thus occupied, as I journeyed to Damascus with authority and commission from the chief priests, at midday, O king, along the road I saw a light from heaven, brighter than the sun, shining around me and those who journeyed with me. And when we all had fallen to the ground, I heard a voice speaking to me and saying in the Hebrew language, “Saul, Saul, why are you persecuting Me? It is hard for you to kick against the goads.” So I said, “Who are you Lord?” And He said, “I am Jesus, whom you are persecuting. But rise and stand on your feet; for I have appeared to you for this purpose, to make you a minister and a witness both of the things which you have seen and the things which I will yet reveal to you. I will deliver you from the Jewish people, as well as from the Gentiles, to whom I now send you, to open their eyes, in order to turn them from darkness to light, and from the power of Satan to God, that they may receive forgiveness of sins and an inheritance among those who are sanctified by faith in Me.” Therefore, O King Agrippa, I was not disobedient to the heavenly vision. Paul’s conversion led to many being given the opportunity to change their values more fully. However, the fact remains to this day what king David wrote and that Paul later quoted in Romans 3:11, “There is none who seeks after God.” Carnal people are so imbued with their own systems that they will not change unless essentially forced to. In this episode, the woman represents the unconverted person who is confronted by Jesus’ truth. She is informed of changes she must make if she is to follow Christ. If a person truly wants to change once he realizes that all his life he has been sincerely ignorant regarding God and his values, the newly converted individual must seek to make whatever changes are necessary. Jesus shows her God expects this. In Matthew 22:37-38, Jesus provides us with the commandment that lays the foundation for all others: “Jesus said to him, ‘You shall love the Lord your God with all your heart, with all your soul, and with all your mind. This is the first and great commandment. '” This command leaves very little out in terms of our devotion to God. It involves the fear, service, obedience, and worship of the great God who is the Creator. The dictionary definition of worship says it involves intense admiration, adoration, honor, and devotion to someone or something. Practically, worship is our response to our god. 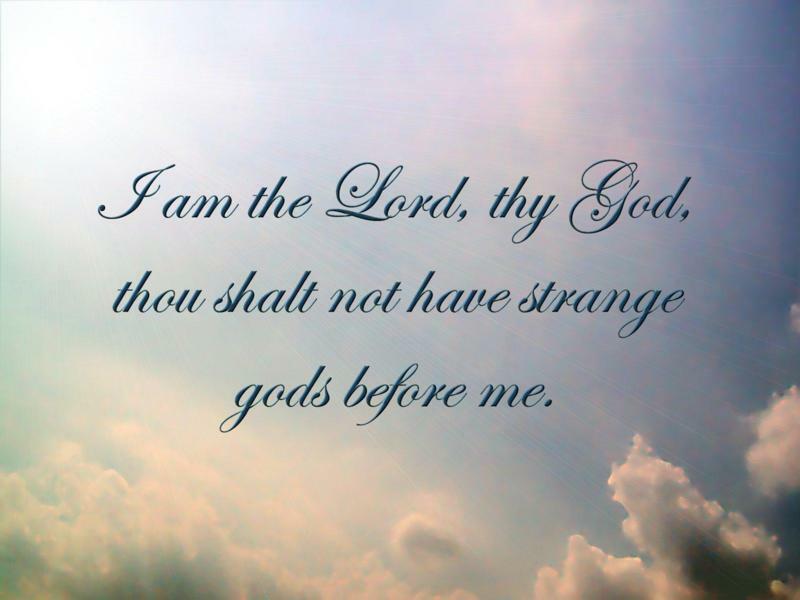 The KJV and the NKJV both translate Exodus 20:3 as, “You shall have no other gods before Me.” It is better understood as, “You shall have no other gods in place of Me.” The term “before Me” allows enough wiggle room that it can be argued that other gods are permitted as long as God comes first. In reality, God permits no other gods at all! Genesis 1:1 informs us, “In the beginning God created the heavens and the earth.” God is Creator. This is how God introduces Himself in His Book. Paul directs our attention to this very point in Romans 1 as where men stumble by not truly acknowledging Him as Creator God, sovereign over every aspect of what He had made. But “Creator” can be just as vague as “ballplayer,” “rock star,” or “actor,” if we never show enough interest to study and observe the awesomely beautiful distinctiveness of His character, power, and way He reveals regarding His Person. Do we devote as much time, concern, or effort in admiring God’s great ability as Creator as we do the men we admire? Using Himself as the Model, God created the potential for the qualities and abilities we admire in others to be in us, and He has far more and better in Himself than we can comprehend. The world has conditioned us to think of worship as something we do once a week. This is woefully inadequate in terms of what God expects. Is God merely on an ego trip to receive “Hallelujahs!” from His worshippers? No! Everything He asks of us is for our good because of what it motivates us to do and become. American philosopher Ralph Waldo Emerson said, “It behooves us to be careful what we worship, for what we are worshipping we are becoming.” This is true. Because a person becomes or does what his god is, he must be careful regarding his reaction to this commandment because it affects every area of life, thoughts, and action. It is not just a tiny sidebar of life. If kept as it should, it becomes part of the very foundation of what we are becoming. Now the Lord descended in the cloud and stood with [Moses] there, and proclaimed the name of the Lord. And the Lord passed before him and proclaimed, “The Lord, the Lord God, merciful and gracious, longsuffering, and abounding in goodness and truth, keeping mercy for thousands, forgiving iniquity and transgression and sin, by no means clearing the guilty, visiting the iniquity of the fathers upon the children and the children’s children to the third and the fourth generation.” So Moses made haste and bowed his head toward the earth, and worshipped. Yet, mankind is so deluded that, without realizing it, many worship their consciences formed by their own earthly experiences. Their consciences are nothing more than an inner voice, a sort of a moral policeman that has taken up residence within. Can it be trusted? Do we trust ours? This is better than nothing, but conscience is easily perverted and often abnormally developed because it is almost entirely dependent upon upbringing and propaganda from this world’s media. Since this is Satan’s world, there is little chance that a person’s conscience will be entirely aligned with God’s standards. God’s name is “I was, I am, I will be.” He has lived for eternity, but He is not old; He is every bit as modern as tomorrow. When God came as a man, He showed He did not have a completely placid temperament, a God who would not say, “Boo!” He did not just let sleeping dogs lie. He was not uninspired and uninspiring; Jesus stirred people up so that they said, “No man ever spoke like this Man!” (John 7:46). He challenged and exposed the hypocrisies of the religion of His day and was moved to deep anger by the shameless exploitation taking place at the Temple. He was of such personality that He walked unscathed through hostile crowds. Jesus was meek, but the term indicates that He had the power to use as He willed, restraining it as an act of mercy, wisdom, and love. God must be the Source of everything we think, say, and do for us to have a fighting chance to overcome this persistent sin. This entry was posted in Bible Teachings, Inspirational Messages and tagged bible and idolatry, first commandment, idolatry, morality and bible, no other gods before me, praise, putting God first, sin of idolatry, worship, worship and bible, worshipping other gods. Bookmark the permalink.